Evenlode’s Friend is known to her friends as Bex. She is a writer living in rural Norfolk, in the UK. Evenlode’s Friend wants to spread the Good News about how creativity, writing and journalling can heal. After spending several years struggling with caring for her mother-in-law who suffered from Alzheimers Disease, she has now begun a journey back to her creative roots, and invites you to join her on her odyssey through this blog. Evenlode’s Friend wrote her first book at the age of five. It was a picture book and it was about a witch called Hag. Not very original, then, but she did all the illustrations herself, as well as binding it with a proper cardboard cover. Her mum still has it somewhere. She wrote her first novel at the age of 14. It wasn’t very good. She has been unable to work due to ME/CFS since 2001, and has been concentrating on her writing as a result. Since then, she has written seven novels of historical fiction and supernatural romance, as well as a number of short stories. Since 2011, she has been noted mostly for her fanfiction in the ‘Sherlock’ and ‘Lewis’ fandoms. For her seventh birthday, her father bought her a hardbacked A5 notebook to use as a diary because, as he told her then, every young lady should keep a diary. She now has 42 years worth of journal-keeping experience (and a lot of cupboards full of notebooks). She completed a Diploma in Creative Writing and an Advanced Diploma in Creative Writing (Prose Fiction) at the University of East Anglia. (She also holds a BA Hons degree in English with American Studies from the University of Winchester, and an MSc in Information Systems from the University of Portsmouth, but that was a HUGE mistake that she’ll tell you about sometime, if you really want to know.) She has judged a number of writing competitions for the Norfolk Federation of Womens Institutes, where she was Federation Secretary from 1998 until 2001, and wrote a well-regarded column in their monthly county newspaper. She also wrote several academic papers on educational technology while working for the Open University. She is also the creator and friend of Evenlode. If you want to know more about him, click on the page link above. To read Evenlodesfriend’s work on FanFiction.net, CLICK HERE. To read Evenlodesfriend’s work on AO3, CLICK HERE. If you want to contact Evenlode’s Friend directly, you can do so via email at: evenlode1967@gmail.com. 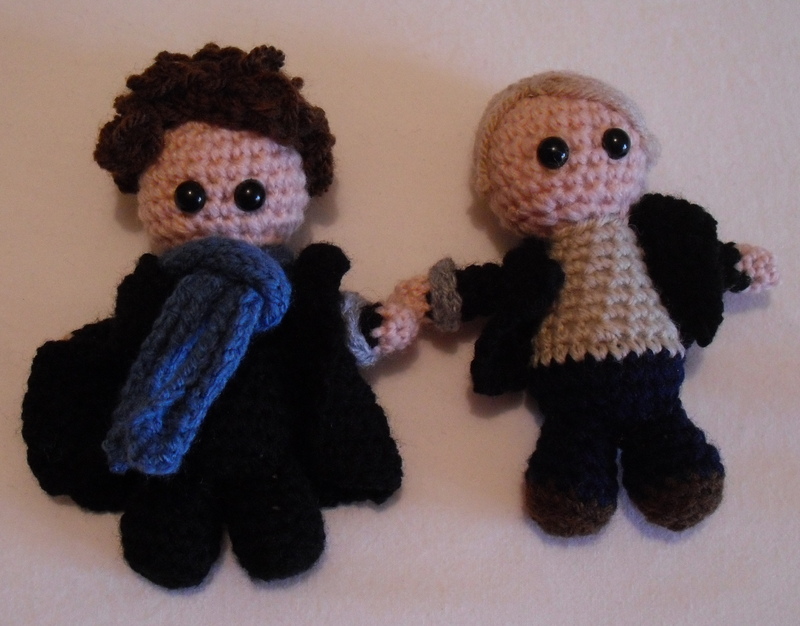 If you are interested in my avatar, these are my little Sherlock Holmes and John Watson amigurumi dolls, made for me by my preposterously talented niece, Phoebe Grassby.